I got this via email, from the council I'm on at the American Cancer Society. The photo is of Kathryn “Kay” Hire, captain in the US Navy Reserve and NASA Astronaut, who recently launched on the shuttle Endeavour. You probably know I have a huge bias in favor of NASA, largely because most of my family works there, but in addition to that (and maybe because of that) because I know how many valuable services NASA has provided to us that help our daily lives, and how much I know they are working on right now that will continue to help us. It's not all about glorified manned space flights -- all of the missions have a greater purpose. So when I got this press release, I thought how awesome is that! And I had to share. On Saturday, February 7, the more birthdays movement will broaden its mission of a world with more birthdays and set its sights on a new frontier – space. Kathryn “Kay” Hire, captain in the US Navy Reserve and NASA Astronaut, will carry a more birthdays T-shirt on board the space shuttle Endeavour. Kay Hire is longtime American Cancer Society supporter and sister of National Home Office employee Becky Hire, director of multimedia services. 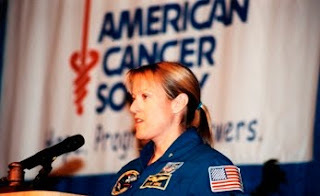 Kay’s last mission into space was in 1998, when she carried the tobacco proclamation. That proclamation is now framed and hanging outside of the office of Chief Executive Officer John R. Seffrin, Phd, at the National Home Office. She was also a speaker at the International Union Against Cancer (UICC) conference and the Relay for Life® Youth Conference in Orlando. Endeavour’s 13-day flight will include three spacewalks and the delivery of a connecting module that will increase the International Space Station’s interior space. Click here for more information about Endeavour’s STS-130 Mission. Click here for more information about Kay Hire. We’re making great progress toward creating a world – and universe – with less cancer and more birthdays!